We aim to perform a prospective, multicentric, quasi-randomized controlled trial with an alternate-month design (1-month periods). 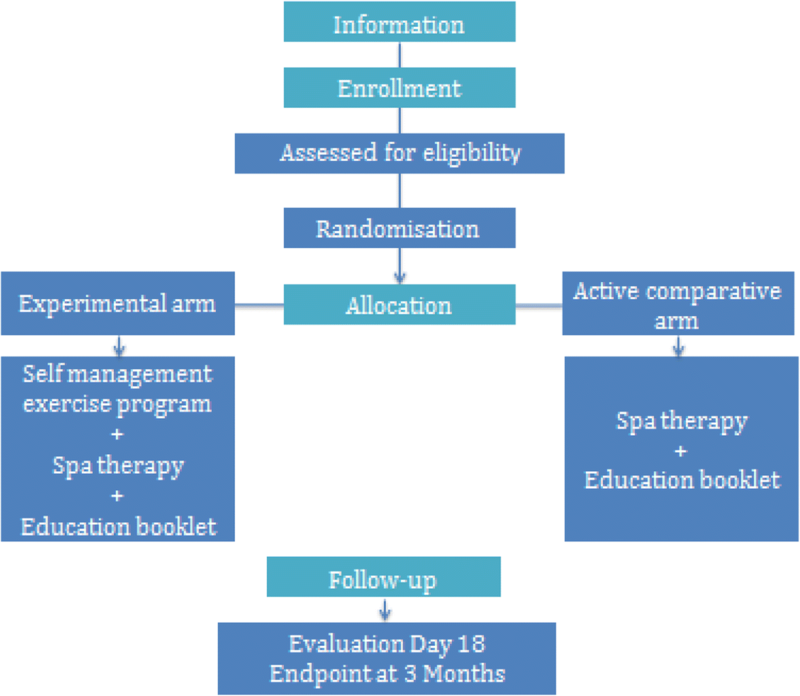 People aged 50-75 years old with symptomatic knee OA (stage I-IV Kellgren and Lawrence scale) with low and moderate PA level will be included in 3 spa therapy resorts. 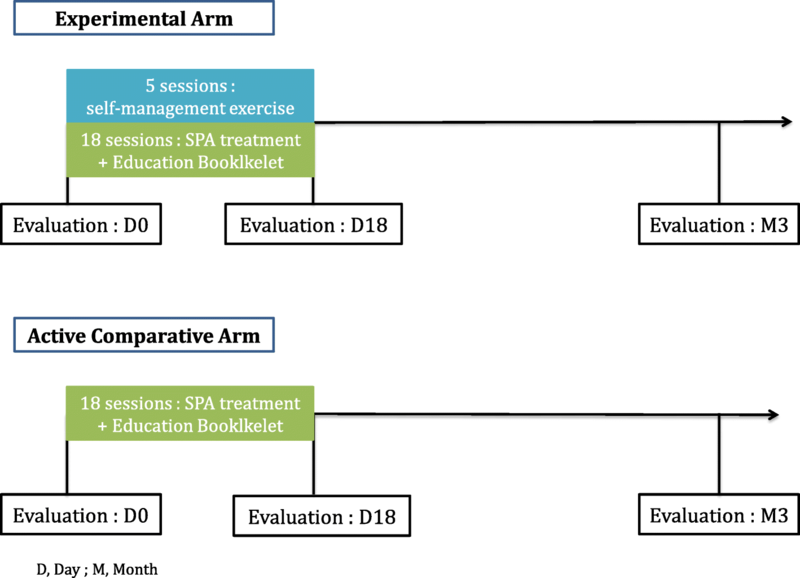 The experimental arm will receive 5 self-management exercise sessions (1.5 h each; education, aerobics, strength training, range of motion) + an information booklet + 18 sessions (1 h each) of spa therapy treatment (STT). The active comparator arm will receive an information booklet + 18 sessions of STT. The primary outcome will be a change at 3 months in PA level (International Physical Activity Questionnaire short form score). Secondary outcomes will be function (WOMAC) pain (numerical scale), anxiety/depression (HAD), fears and beliefs about OA (KOFBeQ) and arthritis self-efficacy (ASES). The barriers to and facilitators of regular PA practice will be assessed by using specific items specifically designed for the study because of lack of any reference scale. International guidelines such as from the Osteoarthritis Research Society International (OARSI) recommend a non-pharmacological intervention associated with pharmacological treatment for pain for people with knee OA. Non-pharmacological therapies are exercise programs (strength training, aerobic activity, adjunctive range of motion, stretching and increasing physical activity (PA) level), self-management education program and weight loss if necessary [7, 8, 9]. Education and self-management exercise have a positive impact on pain, function, exercise level, weight, quality of life, and treatment adherence . Self-management exercise programs have a clinical and behavioral impact . This protocol has some limitations. The quasi-randomized method could be a limitation, but this method is the most appropriate to avoid contamination biases between groups . When assessing the effectiveness of non-pharmacological treatments such as behavioral therapy the blinding of participants and care providers is frequently impossible [52, 53, 54]. Moreover, the success of the treatment often depends on the skill and experience of care providers [26, 55, 56].